Make your donation go the extra mile by doubling it! If you contribute to Friends of Scouting and are associated with one of the companies below, you can arrange to have a second gift sent to the Golden Empire Council courtesy of your company; we'll even credit your unit towards their achievement of its Friends of Scouting goal! As a general rule, the program of a parent firm will apply to its division, subsidiaries and affiliated companies. Some companies will match the gift given by the spouse of an eligible employee. 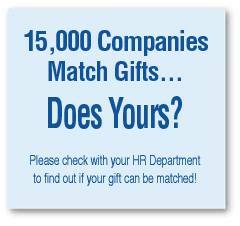 Ask your employer if your company has a "matching gift" program. If so, obtain the proper form for this opportunity; complete it, and turn it in to your District Executive. If you do not see your company listed, check with your employer to see if they will match your financal donation or your volunteer time. If there are missing companies on our list, please send us the update. Are we missing a company or is there a mistake? Please let us know! A.S. Abell Co. Foundation, Inc.
Atlas Rigging & Supply Corp.
Bernd Brecher & Associates, Inc.
International Tel & Tel Corp. The Callanan Road Improvement Co.
C. Tennant, Sons & Co. of N.Y. The Firestone Tire & Rubber Co.
Kidder, Peabody & Co. Inc. The Lawers Co-op Publishing Co.
M.A. Gesner of Illinois, Inc. The New Yorker Magazine, Inc. The Prudential Ins. Co. of Am. The Putnam Management Co., Inc. The Rockefeller Brothers Fund, Inc.
Citizens Fidelity Bank & Trust Co. Towers, Perrin, Fister & Crosby, Inc.
Minneapolis Star & Tribune Co.
Minnesota Mining & Mfg. Co.
Mutual Boiler & Machinery Ins. United Engineers & Const. Inc.
Connecticut Mutual Life Ins. Co.
National Distillers & Chem. Corp.
United States Trust Co. of N.Y.
New England Gas & Electric Assoc. Crum & Forster Insurance Co.